Cunard continues its unwavering commitment to offering guests unparalleled travel experiences with the announcement of Queen Victoria’s refit this May. The highly revered ship will be taken out of service on May 5, 2017 to undergo thoughtfully designed enhancements costing more than $40 million at the Fincantieri Shipyard in Palermo, Italy and scheduled for completion on June 4, 2017. The elegance, history and nostalgia of Queen Victoria’s art deco past will remain, while refurbishments will usher this regal ship into a new, updated chapter. Areas of focus will include the introduction of Britannia Club balcony staterooms and dining for the first time, with a dedicated new restaurant, as well as the refreshing of all Britannia staterooms. 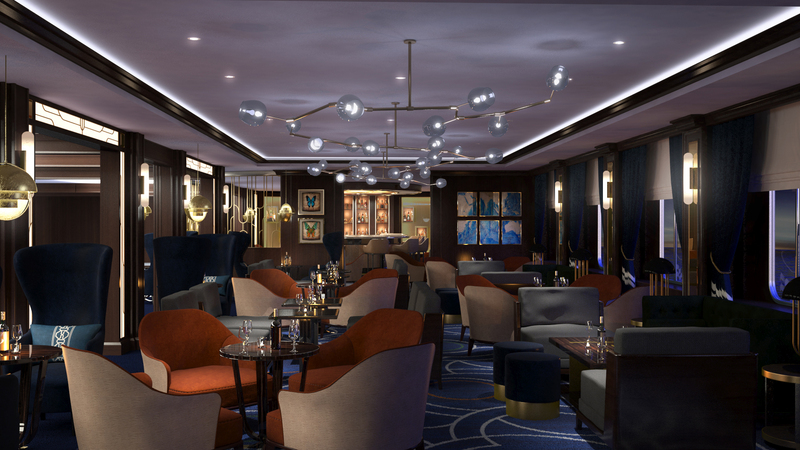 In addition, the ship’s majestic Grand Suites and Deck 8 aft Penthouse Suites will be completely redesigned, and a new Chart Room bar will be introduced. New to Queen Victoria is Britannia Club Dining with the addition of an intimate restaurant and 43 spacious Britannia Club staterooms (A1/A2) in a prime mid-ship location on Decks 7 and 8. The new and refreshed staterooms will feature newly-designed carpets, soft furnishings, new flat screen TVs, as well as tea and coffee facilities. The new Britannia Club restaurant will offer guests the flexibility to dine whenever they choose. Located in the space of the former chart room, the new restaurant will be built alongside the main Britannia restaurant on Deck 2. The Cunard Grand Suites (Q1) will be redesigned and reconfigured to maximize space, offering enhanced comfort and entertainment options. The Aquitania, Berengaria, Mauretania and Laconia Suites will have similar square footage to those on Queen Elizabeth at approximately 1,436 sq. ft. Refreshed designs will include a new color scheme that harkens back to the line’s history with its signature Cunard purple. Created to mirror a luxurious residential apartment, the suites offer fabrics with a variety of rich textures and layers. The Cunard Grand Suites also include: floor-to-ceiling windows and doors, a separate service entrance and hospitality preparation area, a separate snug room with TV, a beautifully-appointed lounge, a master bathroom with sea view, a second bathroom with guest access, a bedroom TV that folds down from the ceiling, a walk-in wardrobe with additional storage units, and a generous dual aspect balcony. Cunard guests will enjoy five new Penthouse Suites (Q4) on Deck 8 aft which will feature floor-to-ceiling windows, defined living and sleeping space and bathrooms with natural light. New color schemes reflect Cunard’s signature jewel tones of deep red and captivating geometric patterns. Additionally, Cunard is pleased to announce a new Chart Room concept will debut on Queen Victoria as part of the refit. The new Chart Room will be located on Deck 2 off the Grand Lobby, where Café Carinthia is currently located. The Chart Room will feature illy coffee, Godiva chocolate treats and light bites by day and stellar cocktails by night. 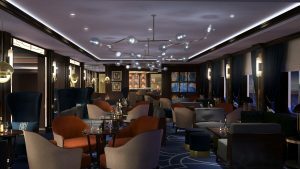 Cunard will also introduce a gin and fizz themed menu to the Midships Lounge, including a variety of wines, Proseccos, Cavas and Champagne alongside premium gins and spirits, all blended to create fresh and inspiring cocktails with a modern twist.